They are not the prettiest in the insect kingdom but weta are an iconic New Zealand species – and they are going places. Tree weta are being collected on Banks Pensinsula as part of a project to move them back into the city. Eleven weta are city-bound – being relocated in portable wooden houses to Riccarton Bush, a six hectare block of kahikatea floodplain forest, surrounded by a predator-proof fence in the heart of Christchurch. Researchers say the urban bush will form a natural laboratory and they have plans to add to the eco-system. Wellington’s wildest night out just got even better! Throughout July and August, we are running a special two-for-one deal on our unique nocturnal tours. Conditions apply. Take a tour by torchlight through New Zealand’s native forest at night. Your guide will help you to spot morepork, tuatara, glow-worms and weka. And if you hear a snuffling and a rustling in the bushes, it will probably be one of our rare little spotted kiwi – there are over 100 living wild in this magical valley! Tours depart nightly, with transport available to and from town for an extra $10pp. Places are limited, so call 04 920 9213 to avoid disappointment! Hollywood has its dinosaur-infested lost islands, now one of New Zealand’s last unspoilt wildernesses can boast a few reptilian surprises of its own. The Sinbad Valley, tucked away in a corner of Fiordland, has revealed a range of weird and wonderful new species over the years, including wetas and other insects. But now a handful of never before seen lizards – distant relatives of dinosaurs – have set scientists’ pulses racing. They’re big, they’re scary, and they’re coming back to the city! 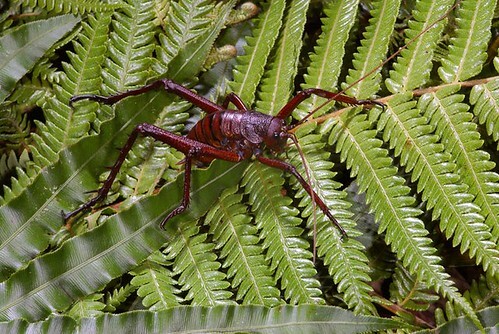 On Sunday 11 February, volunteers, trustees, iwi representatives and invited dignitaries will watch as up to 100 Cook Strait giant weta (Deinacrida rugosa) are released back into the wild at Wellington’s award-winning Karori Wildlife Sanctuary. This will be the first attempt to re-establish this species on the mainland since they became extinct here over a century ago.